BULAWAYO , Jan 18 2012 (IPS) - Tinashe Zuze’s story is a typical one of Zimbabwe’s professionals who have shunned formal employment. Instead of working for someone else, Zuze left his job as a bank teller and entered into the world of “wheeling and dealing” in illegal foreign currency. It turned many into wealthy business people overnight since “the day the dollar died.” Economists call it Black Friday. On Nov. 14, 1997 the Zimbabwean dollar crashed under the weight of unbudgeted spending. The cause was President Robert Mugabe’s handsome payouts or “gratuities” to veterans of the 1970s liberation struggle. The overspending sent the country’s economy into a spiral, which is still being felt today. Zuze’s fortunes faired well at first, and then took a turn for the worse. He first acquired stupendous wealth during the “crazy days” of illegal foreign currency dealing in the early 2000s. But he fell on hard times after the introduction of the multi-currency regime in 2009. But he was not defeated and re- invented himself as an importer of second-hand vehicles from Japan. “It’s been a terrible life,” he mused. But as the country prepares for elections, which long-time ruler Mugabe wants held this year and which will bring an end to Zimbabwe’s crisis-ridden coalition government, calls have emerged from some political elites for currency reforms to bring back the Zimbabwean dollar. “I don’t understand why anyone has the gall to call for the return of the Zim dollar,” he said. “This is the money that impoverished many people and forced me to do all kinds of deals and I recall having stacks and stacks of these dollars and failing to get rid of the useless notes,” Zuze said. At the height of the economic chaos in November 2008, consumers had to carry sacks and wheelbarrows of cash just to buy small items like milk or bread. Overnight, the cost of bread jumped from two million Zimbabwean dollars to 35 million. It was considered by some analysts as one of the worst cases of hyperinflation of all time. Since the introduction of the multi-currency regime, where transactions are now carried out in the United States dollar, South African Rand and the Botswana Pula, what was once the world’s fastest- shrinking economy is now on the path of slow but sure growth. Proof of this can been seen in the stores as shop shelves are now full after years of botched government price controls spurred acute shortages of basic commodities. However, Mugabe’s Zimbabwe African National Union – Patriotic Front (Zanu PF), the party widely blamed for the country’s economic ruin, has increased its calls for the return of the local currency ahead of elections. The party has criticised the United States greenback for perpetuating the country’s global economic hegemony. Analysts are in agreement that Zimbabwe’s economic crisis has created extremes of both wealth and poverty, destroying the middle class in the process, as salaries remain stagnant, creating ideal conditions for wildcat strikes. But economists and ordinary members of the public are concerned that the return of the dollar could spell disaster. Respected Bulawayo economist Dr. Eric Bloch, who also sits on the board of Reserve Bank of Zimbabwe, said the re-introduction of the local currency would be a “total disaster” for the economy. “The return of the Zimbabwean dollar will fuel massive inflation and return the country to the economic chaos of 2008 as in real terms the currency will be valueless,” Bloch told IPS. “I agree with Finance Minister Tendai Biti that the country should maintain the present situation where the country is using the U.S. dollar. The Zimbabwean dollar means the country will not be able to access international lines of credit as this hinges on the ability to generate foreign currency,” he said. For political analyst and academic Donald Sithole, the return of the Zimbabwean dollar could be a recipe for social upheaval. “We have seen it elsewhere, disgruntled masses taking to the streets not because of political grievances but increasingly to demand economic justice, and the history of the Zimbabwe dollar era could point to the return of worse strife for ordinary people,” Sithole told IPS. “The global financial crisis ought to be a lesson. But we are obviously seeing complacent politicians who think the street protests seen across the world will not happen here because of their renowned repression. But people can only take this to a limited extent. I believe we are treading on dangerous ground,” he said. As the school term opened early January, teacher unions hinted they would boycott classes as they call for for salary increases at a time when the government has approved hefty allowance increments for legislators. “These people want the return of the dollar so that they can loot our resources like they used to,” said Gamaliel Siziba, a secondary school headmaster, referring to long-standing accusations of institutionalised corruption against Zanu PF officials. “This is just insane. We are led by educated people but these are the solutions they offer for economic recovery,” Siziba said. He is not the only one against the return of the failed currency. 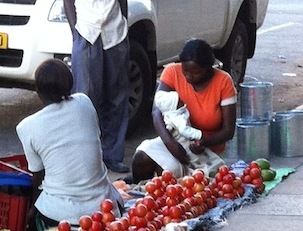 Vegetable vendor Catherine Moyo is of the opinion that the return of the local currency will bring untold suffering. “It looks to me that all of us, besides the politicians, know that the return of the (Zimbabwean) dollar will only mean more suffering as this will mean that forex will disappear from our streets,” Moyo said. A thriving illegal foreign currency market had been blamed for the artificial price distortions for basic commodities in 2008.